Okay, we’re so close now! It’s time to bind off that lovely arm knit fabric from your arm. It’s okay, you can be a teeny, tiny bit relieved (joyous!) that you are done and it’s coming off. It’s so beautiful and fast, isn’t it? When I see regular knitting now, it seems so miniscule! If you want to skip to the end or have a portable copy, you can purchase the instant download PDF of complete instructions here. Or, you can buy a kit with the perfect gorgeous, luxury yarn here. Binding off arm knitting is done the very same way you bind off traditional knitting. If you’re not a knitter, have no fear, it’s not hard and there are photos every step of the way. // Start with all the stitches on your left arm (you can bind off either way, but this direction is more typical). // Knit two stitches on to your right arm. // With your left hand, pick up the first stitch you knit on your right arm. // Pull that first stitch over the last stitch you knit. // Knit the next stitch from your left arm. You should have two stitches on your right arm again. // Pick up the first stitch on your right hand again. // Pull it up and over the stitch you just put on. // The stitches you bind off will chain with one another over the top of the fabric. // Remove the last loop from your arm. Loosen loop a bit so the stitches won’t pull out. Lay down your piece. // Cut the working yarn with enough yarn to seam your project (you need approximately 1.5 yards to seam the cowl). // Bring the end of the yarn you just cut through the loop that remains. // Tighten the loop. It’s ready to finish! The finishing tutorial will include a tutorial on mattress stitch seaming (which is what you need if you are making the cowl) and other finishing details (if you are just making a scarf or something else). The mattress stitch creates an invisible seam on the right side of the knit fabric – so great! It’s super easy to do and you’ll use it for all sorts of other knitterly goodness, too! Look at this beautiful fabric. I want to dive into it! I am very excited to try this! I love big, chunky scarves. This is a perfect project for me. I wanted to download the PDF but seem to be having trouble. When I click on the link nothing happens. Any suggestions? Hi Laura, I’m so glad you are excited. It really makes amazing scarves. Here is a link for the PDF – It should open to Etsy: https://www.etsy.com/listing/179944176/arm-knitting-how-to-pdf-a-step-by-step? Hi Clarissa! I think I included a tip on this in Part II. When you want to take a break, get all the loops on one arm or the other. Place all the loops one by one onto a strand of spare yarn (different color if you can). Go about your business. Then place the loops back on the arm they started on. The knit side should be facing you. The working yarn should end up at your hand. I just completed my first arm knitting project thanks to your wonderful tutorial! Even though I am left-handed, your pictures were so good that I was able to figure out just what to do. Thanks so much for a fun and relatively simple project! When I needed a break I took a large safety pin and ran it through my loops it was super handy. I love how easy the tutorial made this and am now making tons of scarves. Great! I’m so glad you are enjoying the tutorial! Happy fall!! This is a great tutorial! I’ve made a few now. I think I do the ends too tight…so…I guess that means I cast on too tight? I’m not sure – but still learning. Fun new hobby! Hi Aimee, If your cast on edge is too tight, you can loosen it! just start at the tail and move the stitches apart from each other a bit. Basically the length from that first row of stitches will move to the edge and widen it. I’m so glad you’re enjoying it! knit on! Just learned about arm knitting. What fun and your directions are so clear. I can’t wait to show my granddaughter. Hi Kay, Thanks so much! I hope you have an amazing time with your granddaughter! Help please! For some reason when I finish a row (especially the first row) I have a huge loop at the end that is really loose. Any ideas as to what I’m doing wrong? 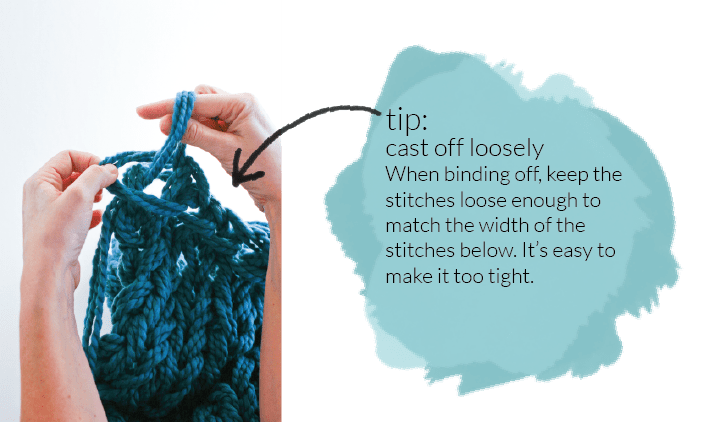 Jessica, If its only that first slip knot stitch, it will tighten when you loosen your cast on edge at the end of the project. Basically the cast on stitches are tighter than how the rest of the stitches flow. when you loosen this at the end that,slip knot can tighten down. You basically are moving the slack from that slip knot back into the stitches that came after it. The size of it will also be less noticeable after your seam up your project as well. There is also a tendency for one row of edge stitches to remain big. Part of this is because of how the yarn flows when you go back the direction you just came from. It makes the working yarn tighten down the stitch beneath it and leave the length in the edge stitch you just did – does this make sense? You can adjust this unevenness after you finish. or pay particular attention when you are switching directions to leave the stitches before and after that edge stitch as even as they can be. For the most part, those larger stitches will be hidden when you finish your project as the edges curl in a little. Hope this helps! My arm knitted scarf has loose loops. How can a tighten up these. I rarely ever comment on things but I need to say that this four part series is the best tutorial I’ve ever read! For anything, not just arm knitting. You are clear and thorough. Just wanted to say thank you-job very well done! I’m very excited to give arm knitting a go. Thanks so much, Meg. This comment means a lot to me! I finished my blanket but not too thrilled with it. Using three strands doesn’t work well. Some become looser than others and therefore the knit stitch isn’t tightly formed. The arm also causes the stitches to be too loose with three strands. In order to be successful with arm blankets use a THICK yarn only so you won’t need the three strands. It will look much better. Hi Cindy, Thanks so much for your comment. I’m so sorry you weren’t happy with the result of your blanket. It sounds like the yarn you chose wasn’t quite thick enough. Some of the super bulky yarns are too thin for three strands. Sometimes I do my blanket with 4 or even 5 strands. 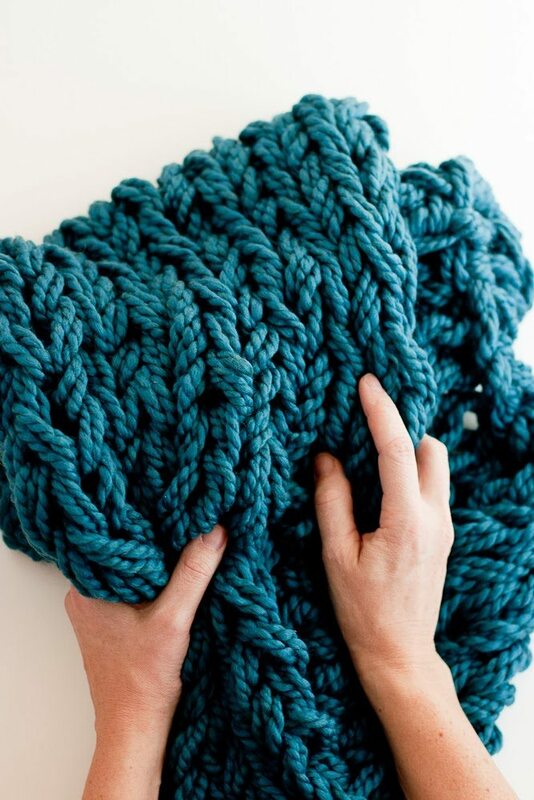 If you want your stitches tighter, check out this post: https://www.flaxandtwine.com/2016/04/arm-knitting-tighter/ I LOVE making arm knit blankets with the thick yarn. Unfortunately, this yarn is much more expensive than typical craft store yarn. But, there are a lot more options now than when I first did this post, too! All my instructions work with the thick yarn, so I hope you give it another whirl! Happy making!